Neuroimmunol Neuroinflammation 2017;4:258-9.10.20517/2347-8659.2017.48© The Author(s) 2017. 1Psychiatric Research Group, LVR-Klinik Bedburg-Hau, 47511 Bedburg-Hau, Germany. 2Centre for Cognition, Donders Institute for Brain, Cognition and Behaviour, Radboud University Nijmegen, 6500 GL Nijmegen, Gelderland, The Netherlands. 3College of Korean Medicine, Sang Ji University, Wonju 26339, South Korea. 4Institute of Experimental Psychology, Heinrich Heine University, 40225 Düsseldorf, Germany. 5Research Group of Pain and Neuroscience, Kyung Hee University, Seoul 130-701, South Korea. 6Brussels Institute for Applied Linguistics, Vrije Universiteit Brussel, 1050 Brussels, Belgium. Recently, transcranial magnetic stimulation (TMS) has increasingly been used to investigate the neurobiology of schizophrenia. In those studies, researchers applied TMS in combination with motor evoked potentials (TMS/MEPs) and high density electroencephalograms (TMS/hd-EEG). The studies revealed significant impairments in cortical excitability, inhibition, and oscillatory activity, which are more prominent in the frontal brain areas, in patients suffering from schizophrenia compared to healthy controls. Future TMS studies may help explain the underlying neurobiology of schizophrenia, and TMS may help monitor and perhaps further optimize the effectiveness of treatment interventions in patients with this disease. However, despite the potential of using TMS in the investigation of the underlying neurobiology of schizophrenia, three critical notes are essential. First, so far, TMS studies on schizophrenia have been neither robust, consistent, nor standardized enough and have had high risks of publication bias, as was recently concluded in a large systematic review of forty-one trials by Dougall and colleagues. Studies differ in numerous variables, for example, the stimulation intensity or length, the areas of the brain that are stimulated, and the design of the same TMS condition. Those variables could have great impact on the effects of TMS in the studied population. Therefore, better, well-developed TMS studies that test specific underlying neurobiological working mechanisms in schizophrenia are warranted. 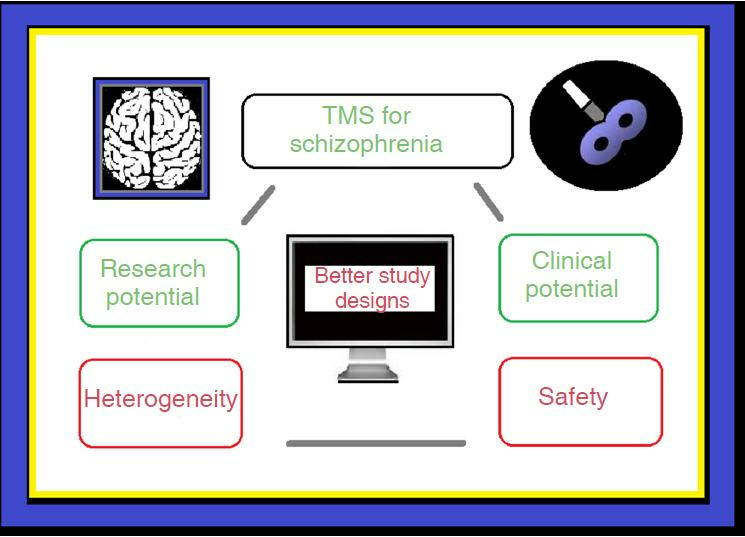 Moreover, schizophrenia is not a static, but rather a dynamic, disorder; therefore, TMS studies should focus more on patients with different stages of schizophrenia, i.e. patients experiencing their first episode of schizophrenia versus patients with chronic schizophrenia. Second, within the studies, insufficient attention has been paid to the safety of using TMS on patients with schizophrenia. This is remarkable considering that a vivid discussion of the risks of using TMS to treat psychiatric patients is ongoing. From the literature, for instance, human subjects, after having been treated with TMS, are known to suffer from minor complaints, such as headaches, pain due to burns caused by the scalp electrodes, local pain, etc. [4,5], and major complaints, such as mood changes, seizures, induction of hyper- or hypomania, etc.[4,5]. Obviously, in an extremely vulnerable population, such as patients suffering from schizophrenia, those side-effects might be more prominent and may lead to even more adverse events and difficulties in the patient’s life. Third, as to the underlying neurobiology and possible treatment interventions of TMS in patients with schizophrenia, the clinical diagnostic issue of the heterogeneity of the disorder, which is a typical characteristic of schizophrenia, is not taken into account. Although the symptoms may be common, schizophrenia may have many different causes that are influenced by genetic and environmental factors, resulting in a very heterogenic population of patients. The answers to the questions of how informative the TMS findings that have been collected on schizophrenia so far with respect to those subtypes of patient groups with schizophrenia are and what those findings mean at the individual patient level (e.g. with respect to gender differences, interactions with individual pharmacological treatments, etc.) remain unclear. To conclude, the critical issues mentioned above are shown in Figure 1. If progress is to be made in understanding the underlying neurobiology of schizophrenia and in particular, if safe TMS-based treatments are to be developed for patients suffering from this disease, these issues need to be addressed in future, well-designed TMS studies. The results of such studies should more clearly expose the full potential of using TMS in the treatment of patients with schizophrenia. 1. Kaskie RE, Ferrarelli F. Investigating the neurobiology of schizophrenia and other major psychiatric disorders with transcranial magnetic stimulation. Schizophr Res 2017; doi: 10.1016/j.schres.2017.04.045. 2. Dougall N, Maayan N, Soares-Weiser K, McDermott LM, McIntosh A. Transcranial magnetic stimulation for schizophrenia. Schizophr Bull 2015;41:1220-22. 3. van den Noort M, Lim S, Litscher G, Bosch P. Transcranial magnetic stimulation for treating older patients with treatment-resistant depression. J Affect Disord 2017;225:278-9. 4. Davis NJ. Transcranial stimulation of the developing brain: a plea for extreme caution. Front Hum Neurosci 2014;8:600. 5. Rossi S, Hallett M, Rossini PM, Pascual-Leone A; Safety of TMS Consensus Group. Safety, ethical considerations, and application guidelines for the use of transcranial magnetic stimulation in clinical practice and research. Clin Neurophysiol 2009;120:2008-39. 6. Arnedo J, Svrakic DM, Del Val C, Romero-Zaliz R, Hernández-Cuervo H, Molecular Genetics of Schizophrenia Consortium, Fanous AH, Pato MT, Pato CN, de Erausquin GA, Cloninger CR, Zwir I. Uncovering the hidden risk architecture of the schizophrenias: confirmation in three independent genome-wide association studies. Am J Psychiatry 2015;172:139-53. 7. Takahashi S. Heterogeneity of schizophrenia: genetic and symptomatic factors. Am J Med Genet B Neuropsychiatr Genet 2013;162B:648-52.